Summary: Deposit with their recommended brokers for access to their tools and community. I'd still like to see more in terms of transparency with this project. Today I’m providing a review for a new binary options service that claims to be the best in indicators, signals and webinars, Binary Orders. This website has both a Facebook page and YouTube channel with a pretty substantial following, so it will be interesting to see what I can uncover. The creator of the Orders web-site is Alexandru Radulescu runs the business out of Bucharest, Romania, but there is no address provided. Traders can get in touch with the support team via skype at support.binaryorders, email [email protected] or phone +40 732 209 683. For all the latest binary options reviews, see our front page here. 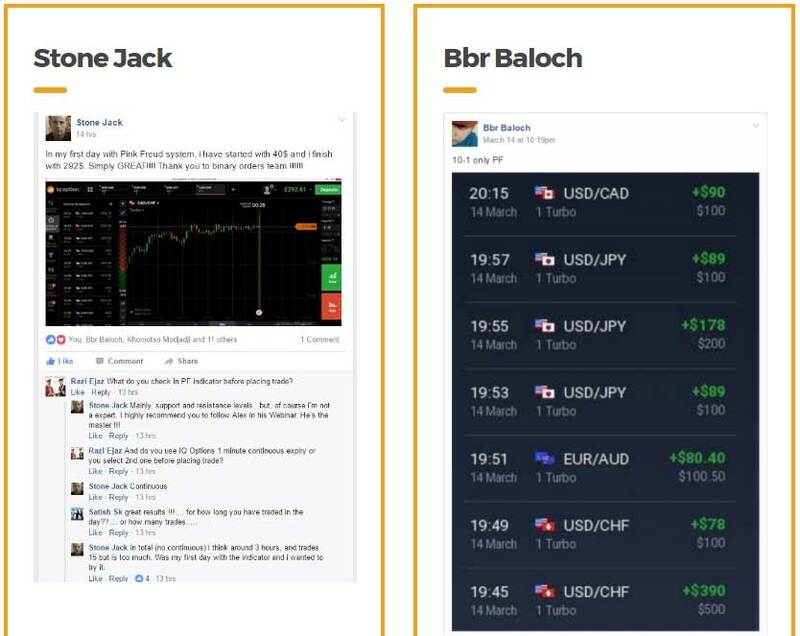 From my initial impression, the Binary Orders team is offering a handful of services as long as traders register and deposit with their preferred binary options brokerage. Before registering, there is not a whole lot to go on in terms of tangible evidence that the indicators and systems truly work. That doesn’t necessarily make this a terrible investment by any means, but it does have us going headfirst into the dark. Alexandru wants to create a community where traders have many different opportunities, so they can find the right fit for their needs. The sales page also claims to provide traders with live trading sessions the last up to 3 hours every single day. During these sessions traders gain access to live trading signals and can follow along with the progress of the professional traders. The Binary Orders team also feel that it’s very important to support each trader who joins the membership group by providing different resources and a forum. At this point in time, the form is not very active with the majority of sections having gone weeks or months without a post. It really comes across as a bit of a ghost town. So, I’m not sure how active this community is in 2017. Despite all the followers, there is very little feedback from the community outside of their own Facebook page and YouTube channel. With the amount of followers their social accounts have, it would only make sense that they would have a large contingent of reviews around the internet. Sadly, all we really have to go on is a bunch of intermittent screenshots on the Facebook page through the month of March. Considering they do live trading sessions every day, I’m expecting the developers to provide us with a trading statement from every single day they’ve done a session. Seeing screenshots of 4-5 60 second trades winning in a row doesn’t really put my mind at ease. There are also testimonials on the website. One of them from Pablo Moreno reads “Alex is the best, I have no doubt about this. My win rate is over 80% and I made accurate calculations. I can say that I made a monthly profit of over 3k in the last 3 months.” Again, this is all in good, but it doesn’t provide me with the level of verification or authenticity I am looking for. There are certainly some impressive elements in the Binary Orders approach. The website is very professional, Alexandru Radelescu’s message is positive, but there isn’t enough in terms of results to push me to sign up with another binary options broker through their affiliate link. They tell us that they have a real community, no fake promises and that they are very transparent. I hope that they take some of my advice and start providing a daily recap of their trading sessions. After I see this, maybe I will consider signing up and providing a higher rating than the 3 star that I’m giving today. If you are a member of the service, please leave a comment and let me know how you feel about BinaryOrders. I can’t recommend BinaryOrders for a simple reason. You can join them signing up through BinaryMate or TraderVC. Both BO-brokers are big-time scam-brokers. Now tell me … does a legit company need to promote scam-brokers to get some money or they are simply a fraud too ? Stay a way from them as well as from BinaryMate and TraderVC !!! The Binary Orders “Romanus” robot traded live from Oct/Nov ’16 to May ’17. Such performance is very marginal for profitability and thus cannot be advised. However – daily live webinars are held by Binary Orders and these do appear (on average) to be reasonably profitable. & 2/ to avoid the robotic system. Can we not see statistics from the webinars? The webinar statistics may be observed on the Binary Orders forum. The forum posts claim to take an average of the user entered results. However – since individuals may or may not post their results correctly, not all users post results and different users will have different performances due to broker and internet handshake connection speeds… the actual performance is possibly best observed by attending a few webinars. Is there a reason why the vendor doesn’t track and provide these results John? BinaryOrders is very good and I am a member. This is the best and no monthly fees for great education and very good signals as you learn. It was good to read your assessment of Binary Orders and after reading I felt a need to try and add some more substance to the data you have used for your review. I think you’ll find my experience useful. I found Binary Orders in February and signed up within a couple of days because I noted they were different. From what? You might ask. Well up until that point and since the summer of last year, I had been with Banc de Binary and 11 other brokers, looking for an organisation that could really help a new person develop a new found passion for trading. In addition to the brokers, I subscribed to 13 YouTube channels and read avidly. I needed a mentor but I couldn’t afford the right one. I needed to exchange ideas with people similar to me in terms of experience and opportunities to do this are rare, without making a financial commitment. I also recognised that I was most comfortable with technical analysis before trading and so I wanted to work with somebody who would explain these technical aspects as we proceeded. I have found a very versatile and complete package with Binary Orders. This is how I use the service. I rarely miss a webinar. Yes there’s a lot of repetition but most people need that and it gives confidence when you get your head around complex trading issues. I watch the Telegram group and help new people if I can and others helped me. I post on the Forum and on Facebook to encourage others to do the same. I trade using 2 of the Binary Orders bespoke signal packages and after a period of gradual build up, gaining experience, I now exceed 80% success rate. I can provide verifying data from my broker if you would like to see it. Not everybody is as active as me. I think the group size was around 130 in February when I joined and now it’s about double that. Not staggering growth, but without the filters to weed out time wasters, I feel my progress would not have been so dramatic as the back up team would have had too many people to look after. I feel your comments are good and accurate in your review but I think the Binary Orders service deserves a better star rating based on my protracted experience rather than the snapshot which obviously left you wanting. Binary Orders have a great future and your review comes at a time when they are going through some growing pains. I would urge anybody who is interested to take up the new 7 day “look and see” deal before they commit.